Well, this isn’t a Kirby no Omachahako, but it appears Callis wants this here to have the blog appeal more to the people who jump at “Beta” content. I’ll start with crediting; This ROM was given to me by Callis, who in turn got it from “Mink”, who Callis knows more than I do, since he’s actually talked to that person. But yeah. Callis gave me the ROM marked “Beta” – which I’ll admit is a term I don’t like using in an instance when it appears this is meant to be a public demonstration, but hey, everyone loves betas! – and I went to work popping it into VBA, leading to the Youtube video embed. – When walking off a ledge or after spitting out air, you are placed about 6 pixels lower than on the official version. Also his sprite is partially inside the floor before Kirby gets grounded. So it looks like the correlation between his sprite and hitbox is different. – The “enter door” sound effect is slightly different, as if it plays twice quickly in a row. 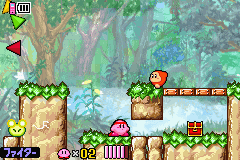 – When running and letting go of arrow keys, Kirby will keep running until he runs out of speed on the official version. He switches to walking in the beta version. – Enemies’ invincibility periods don’t work when Kirby moves through them (after he got hit), so they are hit once every frame. Their invincibility periods are intact when Kirby moves through them after he ate an invincibility candy. – The “ability get” sound effect plays right away when inhaling an enemy in the beta version. – Ability stars don’t move away quicker when hit by an enemy, in the beta version. – When using Spark ability’s or Fire Kirby’s attack, its sound effect stops playing after a buddy kirby inhaled an ability or if certain sound effects play, in the beta version. – Spark Kirby has a darker diadem and the “spark hair” is different in the beta version. – Fighter Kirby shoots a much faster uncharged shot in the beta version. His charged and desperate shots seem to be same speed, however, they don’t disappear as fast in the beta version. – Fighter Kirby’s Up-B has a different sound effect. – When the game is paused, pressing Start doesn’t do anything on the beta version. In the official version it takes you back to the game. – Throughout the game, enemies are placed in different places or are different, graphics are different at some places, the backgrounds are slightly different, and the level layout or graphics is different sometimes. – You can’t cancel out of your “blowing up” phase by inhaling or using your ability, in the beta version. – When inhaling food, Kirby won’t interact with it, i.e. he won’t actually inhale it and he can stop inhaling early. 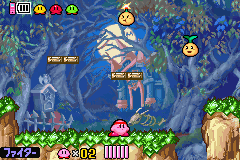 – Ability stars can fall into pits and don’t break right away, unlike in the official version. – You can hold R to make Kirbys that leave the room come back to you. – You can’t L-Warp in the beta version. Sometimes L doesn’t do anything. Other times it behaves like R.
– CPU-Kirbys can inhale your ability stars in the beta version, they can’t in the official version. – Ability roulette doesn’t have any sound effect. The ability display is glitched for one frame, then intact for three frames, etc. On the official version, the display is never glitched. – Many abilities are missing. There’s only Stone, Cutter, Sword, Spark, Fire, Cupid, Fighter (am I missing something?). – When Cutter Kirby’s cutters bump into a wall, they won’t disappear after a few frames on the beta version but they will keep flying to the bottom. – As Sword Kirby, you can’t go into the multi-hit ground combo (after the first slash) as quick as you can on the official version. – Sword Kirby’s sound effect when doing the spinning attack in the air is cut off. – Stone Kirby in stone form is pinker in the beta version. – Stone Kirby, when rolling across the ground in stone form doesn’t assume his normal stance (when he’s lying on his side or diagonally) in the beta version. – When switching from Stone form to normal form, he bounces lower in the beta version. – It seems, when Kirby is going into Stone form while running, he gets a little speed boost, making him roll further. – The “Dark Kirby” sound effect is different on the beta version. – You can inhale Dark kirby right away on the beta version. On the official version he behaves like a heavy enemy. 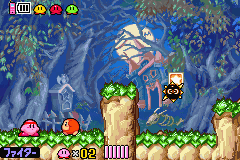 – Dark Kirby drops a 1-up, maxim tomato or invincibility candy on the official version. On the beta version, he drops nothing. – After Dark Kirby disappeared, if you die he will appear again on the official version but he won’t on the beta version. – When falling into a warpstar as Stone Kirby in stone form, he will fly through the star on the beta version but he will grab it on the offical version. – Moonlight mansion theme starts playing a room after the room you landed in with your warpstar from RR, on the beta version. On the official version the theme starts playing in that room already, instead. – CPU Kirbys can’t grab warpstars on the beta version. – After going through a door, Kirby is invisible for a few frames. – Hitting the big switch in Moonlight Mansion doesn’t make it disappear. It disappears only when leaving the room. – Going through the gate in Moonlight Mansion towards the main room makes a different sound effect than the usual going-through-door sound effect. – When opening a treasure chest, the acquired item is shown slightly longer than on the official version. – After beating King Golem, the main room sound theme starts playing on the beta version. And there’s no blue flashing light around the mirror shard. After acquiring the shard, it takes about 3 seconds longer to switch to the mirror gate cutscene. – After beating King Golem, the game shows a release date screen and eventually goes to the title screen. Nevertheless, my stubborn streak compells me to mark the download description as “Sample”, a term more commonly associated with game displays or demos. Good Luck with remaining internet site. « This week in BS-X Project: ASCII Data Pack emulation + New Data Pack ROM batch.